You are the opposite of ordinary; you are extraordinary. It only makes sense that your night matches your uniqueness. On this occasion, embark on a concert cruise around New York City. Now, that's more like it! Sit back, relax, enjoy the refreshing breeze, and listen to live jazz music played by professional musicians. With the backdrop of the NYC skyline, this is truly a remarkable experience. See the sights, embrace the music, and listen to the cool rhythms of bebop, smoky blues, ballads, and other jazz standards. See -- and hear the city... like never before. Note: Acclaimed jazz guitarist, Joe Cohn, and accomplished saxophonist Ian Hendrickson-Smith, leads this swinging quintet. Joe & Ian will be joined by a variety of other well-known guest musicians booked by Jazz Standard founder, James Polsky. The exact boarding time will be the time listed above, but it is highly recommended that you arrive 15-30 min in advance to check in. There are no refunds; all sales are final. However, you may reschedule, based on availability, up to 48 hours prior to scheduled departure time at no additional charge (72 hours for groups of 10 people or more). After 48 hours, a $30 per passenger surcharge will be applied due to upfront production costs associated with event. No Shows and last-minute cancellations within 2 hours of departure will result in forfeiture of ticket. Had a really great time. Captain and crew were great people, as well as the guests. Sailed past the classic NYC landmarks on the Hudson and East Rivers. Wine was good with some very interesting wine info as well as vessel history. Weather was amazing, which added immensely to the experience. Will do again, with more friends and family. Shout out to our sommelier, she was great. Very small and intimate experience. 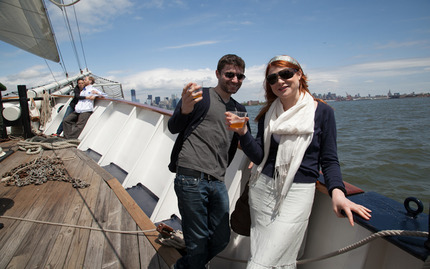 Thanks to yelp events I have had the chance to sail around the city various times. However, at clear waters my bf surprised me with tickets. 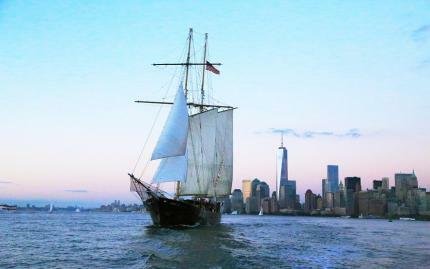 We weren't sure what to expect since we've never sailed around nyc on our own terms. But clearwaters made the experience comfortable, easy and memorable. Their high demand didn't leave us any other choice but to book a 9:30pm sail. It would of been ideal to experience the sail during a sunset but nevertheless it was a great experience. It was beautiful to sail at night and see the nyc lights reflected against the river. Quick notes: tickets need to be picked up before the sail so get there early! They do sell alcohol on board, we bought beer (stella) for $6. The entire sail takes up to an hour and a half. We sailed towards the statue of liberty, beautiful view ofc. I have taken the ferry to see the Statue of Liberty and the lines are long and the ferry is crowded. This is the most pleasurable way to see the Statue. Its a beautiful ship, not too crowded, drinks on board if you like. Very pleasant. Good experience. Fun trip, nothing fancy but crew is lots of fun!! Great views. We didn't have children with us but other passengers did and the bar staff was putting pirate tattoos on them kids loved it. Seems that everyone was just haing fun and even meeting people from different places. I just had my 40th birthday celebration on the Shearwater sail boat. It holds up to 40 adults and we did a nighttime sail from 9:15 - 11:15 PM. I was a little concerned that sailing at night wouldn't be as great as sunset or daytime, but boy was I wrong. It was gorgeous! The crew was awesome and the prices very reasonable for a private charter. All of my friends had the best time. It was amazing to be surrounded by a sailboat full of my favorite people! Thanks SHEARWATER!!! Harbor Lights Sail was a nice time. The weather was delicious, the drinks a tad expensive, but overall a nice date night with my hubby. The captain was a blast. Was something cool and unique to do with my husband. Boat was bigger than i anticipated so fit about 50 people who joined. But the ride was great, smooth, peaceful. We picnic'd before the sail as they don't serve food on the boat just drinks. Isn't something I need to do again but def a cool unique new york'y thing to experience and do. Would be fun in a big group. When looking for activities in the city to do with visiting family members, I often try to brainstorm "what is not in Times Square?" The answer this week was "water!" Enter sailing on a boat in the Hudson. This was a great setup, staff were friendly, easy to find the boat in the harbor, and the trip itself was great. I didn't realize how fast 90 minutes went by: we had one pass by the Statue of Liberty, then back to harbor. A free drink ticket was a nice touch, beers with my wife and mom on a boat was brilliant. Great price, fun outing, would definitely recommend it to others! If only there were fewer people on the boat, and more time out on the water (we did use the motor for a good portion of the trip, but that's Mother Earth's fault), but still a definite must. This is awesome for anyone who likes boats, sailing, or booze! The sun was setting, water was calm, and the weather was beautiful. I've gone for my birthday two years running. The first year the wind was so calm that they had to actually use the motor for a while and it was still a blast. The captain was also very nice! Great trip! check in and get a second free drink! We were very lucky to have gone on a cool overcast summer day where the water was calm and it wasn't 200 degrees and gross out. Crew was really good and the boat was packed to the point where anymore and it might have been uncomfortable. Definitely worth it for the views of the city you get! Add some sort of music to the ride to liven up the crowd, and 11 dollar drinks in the size of a shot glass was laughable. The staff was great and the views were amazing though. To be honest I really enjoyed the entire thing and told a coworker about it and he is booking a trip this weekend. The only thing that kept me from giving the trip 5 stars was the cost of drinks. While I know you have no control over it, it would be helpful to buyers to have a â€œview menuâ€ option or something to that effect that can give you the price of the drinks or even an average cost per drink stat somewhere on the book trip page. Had I known what the prices were I would have bought the unlimited drink pass for $25 when I booked the tickets. Other than that it was a magical night. We really enjoyed the jazz cruise the atmosphere was excellent along with weather and the musicians. The drinks at the bar were very reasonable which was a pleasant surprise. We would highly recommend this trip. Two New Yorkers and two Swedes went on a Sunset cruise in September 2013. It was magical getting up close to the statue of Liberty as the sun was setting. I have seen many sunsets all over the world, but the one behind lady Liberty is probably the most thrilling. To do it on a sailing ship makes it even better. The crew were friendly, professional and making sure that everyone had a good time. My Swedish relatives felt this was the highlight of their NYC visit and I cannot wait for next year to repeat the experience. First of all thanks to Polina Pekarskaya (hope the spelling is close) for your time in explaining the tours when we arrived at the South Street Seaport. This 90 minutes tour takes you over to the Statue of Liberty and then returns via the back of Governors Island. The journey is undertaken under sail and passengers were invited to help raise and rower the sails. It was so peaceful and such a lovely way to relax and take in the views. There was a bar available and toilets that were delightfully clean and spacious. The staff were friendly and attentive and we would consider doing one of the twilight or harbour lights sails next time we are in New York. We went in the twilight cruise with our two boys, 8 and 12. The views of the Statue of Liberty at sunset were staggering, as were the views back to the city as night fell and all the lights shone out. We were the only family but this didn't worry us. There was no commentary about the sights, this wasn't an issue for is as we had already been on a sight seeing tour. Such a cool way to see the sights and great photo opportunities. We had picked a lovely sunny day and it was a really relaxing and enjoyable afternoon. The prices of the drinks on board were cheaper than most of manhattan! The staff were really polite and friendly, it could be improved with some explanation of the buildings and sights we were passing. Overall excellent. Beautiful clipper ship replica with a friendly, relaxed crew. The boat sails around the statue of liberty and provides beautiful views of the harbor and ny skyline as well. What a brilliant way to see round the bay area. Superb views of the Manhattan Skyline, The Statue of Liberty and Jersey. The atmosphere on board was great and they have a well stocked bar. The crew were very friendly and helpful and this was most certainly one of the highlights of our trip. We just took the Twilight Sail,it was a lovely 2 hr journey around the Statue of Liberty and Manhattan, what views! My husband took a turn at lifting the sails with other volunteers. The ship was very roomy, lots of places to sit or be free to wander around. A full bar is on board and there is some music but it was not loud and at the front and back of the ship it was very muted so you could just enjoy the views and quiet.This was peaceful and relaxing, no tourist chatter although the crew will answer questions,no one trying to sell you anything, just a peaceful sail on a beautiful evening. We took some amazing pictures of the Statue and the skyline, the lights were amazing to see from the ship. Very reasonably priced for such a lovely evening. Highly recommend. We chose the twilight cruise and were very happy with it. One criticism is that the music was too quiet, a little louder or not at all. The week we went (WB 5th Aug) the twilight happened as we were coming back to the harbour so some of the best skylines were behind us, which was a shame. The crew did offer to give pointers on what we could see but most people seemed to want to keep themselves to themselves, which was fine. My family and I thoroughly enjoyed the views and ambiance of this clipper ship sail. The staff was very friendly and informative, the cool breezes very welcome, and the beer cold. After days of walking all over the city, the chance to just relax and take in the skyline was fantastic. 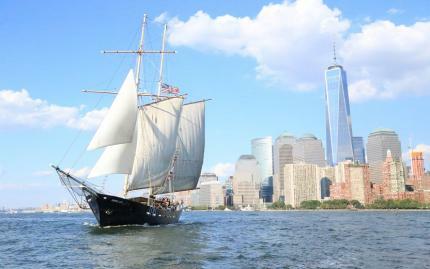 We took a 90 minute Daytime Statue Sail on the Clipper City Tall Ship on 15th July, within hours of arriving in NY. It was a great way to start the 3 days we had. The staff were all friendly and helpful. The cruise was interesting and we took many photos. We were comfortably seated at the front of the ship. Spectacular views of the statue of Liberty and the city as well as all the islands and features on and around the harbour. Went on a lovely 2hr sail this past Saturday. This is not the type of sail that's narrates all the landmarks etc.. If you want that, try the Circle Line. If you want to relax , listen to music at a comfortable level and just enjoy your surroundings, then this is for you. There is a bar on board and 2 bathrooms. If you had any questions about landmarks or the boat, the friendly, helpful crew members were ready to answer. They also let passengers help raise the sails. The boat gets crowded so I would recommend getting online 30 mins prior to get the seats you want. We sat in the front and had a really nice time. My husband & I needed a night off. We decided to try the Twilight Cruise on the Clipper City. BEST DECISION made! We had a great time & relaxed while sailing past the lower Manhattan skyline as well as the Statue of Liberty. Staff was friendly & the cocktails were good!! We will absolutely do this again!! Took the Jazz Sail on Wednesday night and had a wonderful time. Staff were friendly and crowd was nice as well. Romantic and great way to enjoy the Big Apple from a boat. What a Fantastic Trip, to top it off we had perfect weather. It was a great afternoon and would definitely book again in a second! Excellent afternoon. Great date trip.